Q: What are the Run Smarter Awards all about? 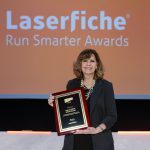 The Run Smarter® Awards recognize the Run Smarter® philosophy in action in the Laserfiche community. Winners are chosen by a committee of Laserfiche staff based on criteria like creativity of the implementation, operational efficiencies realized, use of Laserfiche resources (including user groups, support site, VARs, the conference, etc.) and potential to inspire other customers to think more inventively within their organizations. This year, submissions ranged from contract management, to records management using Laserfiche’s DoD 5015.2 certified integration for SharePoint, to AP processing for the importer of 80% of the coffee used by Starbucks in the US. We also received submissions from a police department using Laserfiche for gang injunctions and the largest homebuilder in the US, who uses Laserfiche for loan processing. Q: What are you most excited about this year? It’s just awesome to see how this award has grown over the years. We gave the first Run Smarter® Awards in 2006; that year, we recognized five organizations. For the 2010 awards, we’re recognizing 18 customer organizations and had nearly 100 submissions. 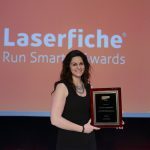 It’s not only a sign of how much the Laserfiche community has grown, but it’s also really exciting to hear about all the innovative solutions out there. I love reading the entries and I love our users! Q: You’ve been on the award committee for four years. Are there any past entries that stand out to you? Oh, definitely. Gulf Copper is one submission that really stands out to me. They had started using Laserfiche, but didn’t have all of their content scanned yet. After getting hit by Hurricane Ike, they literally spent hours microwaving sheets of paper, one at a time, in an attempt to dry them out. That was a pretty heart breaking and unexpected submission. Also, the City of Bakersfield’s use of Laserfiche was pretty cool. They integrate Laserfiche with their ERP and GIS systems to combat graffiti and recover the graffiti cleanup costs. Those were both really great entries, but they weren’t even the winners, which just goes to show you how innovative our users are. Melissa Henley will be presenting the Run Smarter® Awards during a special lunchtime ceremony on January 10 as part of Empower 2011. The conference will also feature customer presentations from many of this year’s Run Smarter® Award winners. Note: Registration for the Empower 2011 conference ends December 31.